Where do companies source/find innovative ideas from? Are these “Big Ideas” or are they incremental “little ideas”? Do their customers and competitors play a role in determining what ideas they work on? What are the sources of internally sourced ideas? What tooling and frameworks are used for ideation? How does an organization select ideas for incubation? Why it’s important to measure the efforts of innovation? As Growth Alchemists, we at Recalibrate are laser-focused on devising innovative ways and means to rapidly propel our client’s business growth. 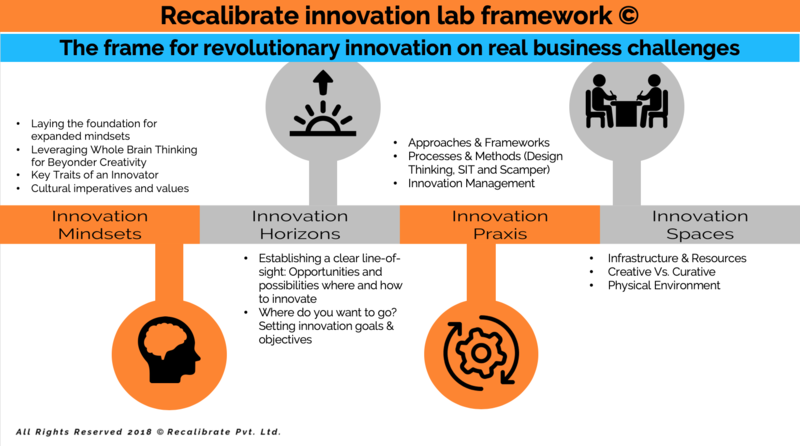 Our approach to innovation is to help instill within our clients an innovator mindset (Genius©: Our proprietary framework for developing an innovator mindset) , innovative praxis and nurturing spaces to innovate. Our client is the world’s largest automobile manufacturer in its category. The organisation has experienced tremendous growth in the past few years by introducing new & innovative practices across functional & business lines. The R&D function has been able to churn out some remarkable innovations in products & processes in collaboration with global IVY League business schools and is currently working on a few breakthrough projects. Building a successful innovation engine requires a multi-disciplinary, multi-mastery, multi-faceted approach. Recalibrate’s Growth Alchemists work as a tightly integrated, well-coordinated team. We bring real-world global innovation experience, cutting-edge tooling/techniques, neuroscience frameworks and technical prowess to bear on today’s innovation challenges. No other organization brings together such a potent mix of experience, expertise and excellence to the table. Building a scalable innovation engine that integrates critical modalities with ground-breaking research and industry-leading best practices is our core strength. Our Innovation Mentoring combines best-in-class conceptual approaches with real-world business experience to create innovation-led transformational change within those organizations that retain us as mentors.